Freeview Play coming to new TVs from Sharp, Toshiba and more | What Hi-Fi? 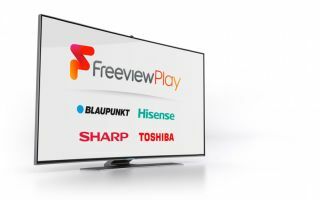 Blaupunkt, Hisense, Sharp and Toshiba TVs will soon be launching in the UK with the latest Freeview Play interface. Freeview Play is coming to more devices in the coming months, which Freeview claims will make it the most widely-adopted catch-up TV platform in the UK. The free catch-up and on-demand service will launch on TVs made by Blaupunkt, Hisense, Sharp and Toshiba in 2017. The service is already available on TVs and set-top boxes from around 20 brands, including Panasonic, Humax, LG and JVC. It lets viewers watch terrestrial shows on catch-up by simply scrolling back in time on the electronic programme guide, instead of loading the dedicated catch-up service. You can also watch on-demand content from the Freeview Play apps page. According to Freeview's boss, the addition of these new partners shows just how fast the platform is growing. "I'm delighted to welcome Blaupunkt, Hisense, Sharp and Toshiba to the Freeview Play platform," said Guy North, managing director of Freeview. " Sharp announced its plans to return to the UK earlier this year with the launch of more than 50 new Sharp HD and 4K TV ranges. MORE: Freeview Play: What is it? How do you get it? With these new manufacturers on board, Freeview Play has become the most widely-adopted catch-up TV platform in the UK, which is no mean feat in just over a year. "Freeview Play now has the content, functionality and distribution to really deliver scale in the TV market, meaning we are well on our way to achieving our ambition of making connected viewing accessible and affordable for everyone." Jonathan Thompson, CEO of Digital UK – a company which supports Freeview and which is jointly owned by the BBC, ITV, Channel 4 and Arqiva – said that he wanted Freeview to become a real alternative to pay-TV services. "Our ambition is to take Freeview from 'what comes with your telly' into an active choice for a broad range of viewers," he said. "The market for Freeview Play is very big. From the core Freeview constituency of 10 million homes, to those currently paying a monthly subscription who are looking for a better deal." Freeview recently announced the Freeview Play specification for 2017. This includes features like search and recommendations, which are usually only found on pay-TV services.